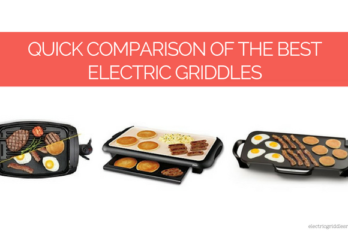 It is a No.1 bestseller among electric griddles in Amazon. 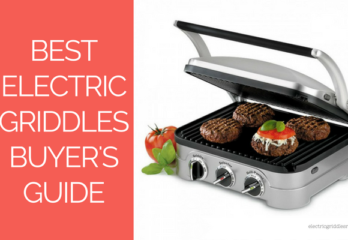 There are so many things that Cuisinart GR-4N 5-in-1 Griddler can do. It has the unique folding feature and one set of reversible plates that provide the options of contact grill, Panini press, full grill, full griddle, or half grill/half griddle without much effort. Cooking is healthier and cleanup is easier as the cooking plates drain the grease. Its rapid heating up system not only lets you prepare breakfast items but also even sear meat. This 5-in-1 Griddler can be used for almost anything, from pancakes to burgers and hot dogs, paninis to meat and much more. The Cuisinart Griddler can reach uniform temperature from 200º-425ºF and has adjustable heat controls with indicator lights. It has dual temperature control that ensures two different meals cooked perfectly at a different temperature. The removable, reversible nonstick cooking plates are easy to clean up and can be put into the dishwasher. This advanced appliance includes a scraping tool and gourmet recipes. This Cuisinart 5 in 1 Griddler also has lightweight plastic cups, which can be placed beneath the drain sprouts to catch any grease runoffs at the corners of the griddle. Well, this makes the cleaning process easy but if you are not careful enough those cups can be lost or tipped over causing a mess. 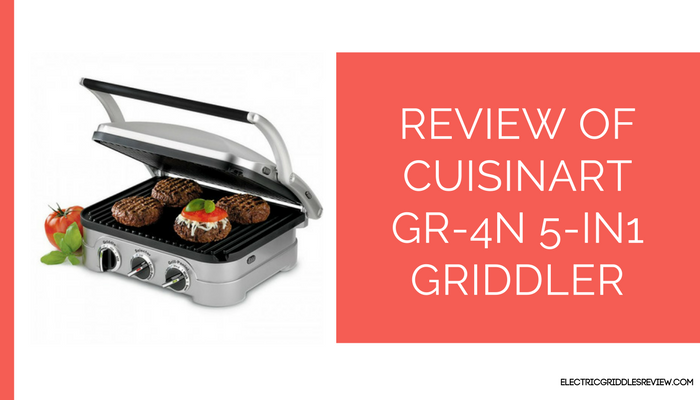 Cuisinart GR-4N 5-in1 Griddler has received almost 5,000 five-star reviews on Amazon. Don’t believe us? Check here for yourself. Cook’s Illustrated, Consumer Search, and many independent online review sites recommend this griddle. It comes with a limited three-year warranty but is expected to last for years. It has a great warranty. It is a 5-in-1 appliance with easily reversible plates. All plates have a non-stick coating. It is a bit more expensive than other griddles. 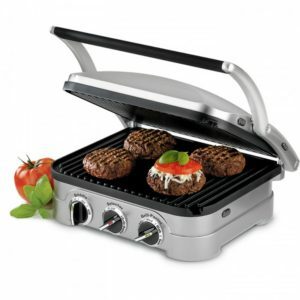 Also, check the review of Cuisinart GR-300WS Griddler Elite Grill.